The Evil Queen has been two steps ahead of everyone the entire season of Once Upon A Time, but Emma and Regina think that they have found a way to outsmart her this time. When things don’t go quite according to plan, they realize that there may not be a way to beat the Evil Queen. It’s up to Henry this week to play hero and solve the mystery to keep his family safe. Regina comes up with the brilliant idea to trap the Evil Queen in the world behind mirrors, which is essentially a prison world. However, the Evil Queen is still way ahead of everyone else and knows what’s coming. She winds up trapping Regina and Emma in the prison world. With the heroes trapped, the Evil Queen decides to play dress-up and trick the rest of the Charming clan. Emma and Regina are quite hopeless in the other world because they are surrounded by one-way mirrors, have no magic, and have no way out of the world. They know that their only hope is if Henry realizes that they are both missing and then magically figures out that they are trapped in the other world. Emma and Regina don’t really do much in this episode, and nothing new really develops. They argue a little over whether Emma will actually be around much longer or not and whether Regina should sacrifice herself to get rid of the Evil Queen. These are the same conversations that have happened before, so I’m looking for some new content at this point. So, Regina and Emma are trapped, and the Evil Queen is running around as Regina. Unfortunately, the rest of the heroes aren’t smart enough to figure out that Regina isn’t Regina, even though the Evil Queen isn’t a good actress. Even with continual slip-ups, it takes until most of the episode has passed for Henry to put two and two together. Before Henry can come to the rescue, the Evil Queen decides to try her hand at some mother-son bonding. She wants to be a part of Henry’s life again, but geos about it in the wrong manner. She tries to persuade him to join her evil conquests instead of being a mother. 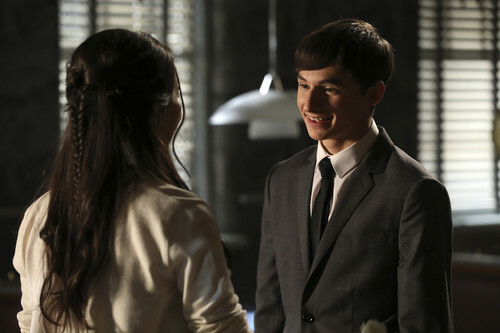 “Regina” helps Henry get ready for the dance at his school, which is when he realizes that his mom isn’t who she appears to be. The Evil Queen then goes about her plan B and tries to darken Henry’s heart. Thankfully, he isn’t dumb enough to fall for her parlor tricks and doesn’t give in to the dark side. It’s nice to see Henry’s devotion to his real moms and that he is a hero who doesn’t want to give in just to get what he wants. Henry also gets the spotlight with his girlfriend Violet by keeping her safe and throwing her a private dance. It’s good to have episodes like this one, where Henry is the center of attention, because he’s not around as much as he should be. There are also a couple of minor stories to mention from this episode. First, Belle is very much done with dealing with her husband and wants to get out of Storybrooke. She enlists the help of Zelena to find a way to be free of Rumple. Zelena needs the sorcerer’s wand to make a portal to safely get Belle out of town, but the wand is hidden somewhere in the pawn shop. Belle and Zelena force Aladdin to help them, since he’s the best thief in town. Aladdin goes to the pawn shop, and Rumple allows him to take the wand. Aladdin also winds up finding two fun artifacts in the shop. We see a glimpse of a monkey on the counter, which presumably is a nod to Abu, and then Aladdin steals a familiar genie lamp. Even though it doesn’t sound like Genie is inside, the lamp may contain someone evil, like Jafar. Aladdin brings the wand to Belle, but to make sure his plan goes right, Rumple shows up and takes it back. Rumple is a huge coward and isn’t revealing what side he actually wants to be a part of. He has some sort of grand plan in play, but it’s not clear as to what he’s up to. The only other fun storyline is Charming and Snow taking turns being awake. I find it quite comical, but after a few days, the new arrangement is taking its toll on them. They seem to be splitting time being awake, but they aren’t using this power to their advantage. They should be coming up with a plan to use each other’s skills against the Evil Queen and Rumple and planning when each person gets to be awake to help. This episode shows why they need to figure this out. I thought “I’ll Be Your Mirror” was better than some episodes of the last few weeks, but there still doesn’t seem to be an endgame in the near future for the storylines this season.